Fifty years after the realization of Frank Lloyd Wright’s renowned design, the Solomon R. Guggenheim Museum celebrates the golden anniversary of its landmark building with the exhibition Frank Lloyd Wright: From Within Outward, co-organized by the Solomon R. Guggenheim Foundation and the Frank Lloyd Wright Foundation. On view from May 15 through August 23, 2009, the 50th anniversary exhibition brings together 64 projects designed by one of the most influential architects of the 20th century, including privately commissioned residences, civic and government buildings, and religious and performance spaces, as well as unrealized urban mega-structures. Presented on the spiral ramps of Wright’s museum through a range of media—including more than 200 original Frank Lloyd Wright drawings, many of which are on view to the public for the first time, as well as newly commissioned models and digital animations—Frank Lloyd Wright: From Within Outward illuminates Wright’s pioneering concepts of space and reveals the architect’s continuing relevance to contemporary design. The exhibition takes its title from Frank Lloyd Wright’s musings on the importance of interior space in shaping and informing a structure’s exterior. “The building is no longer a block of building material dealt with, artistically, from the outside,” Wright said. 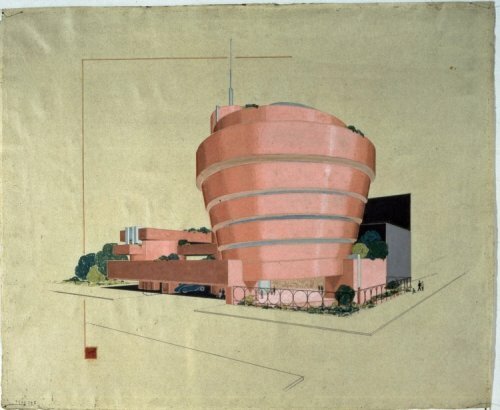 “The room within is the great fact about building-the room to be expressed in the exterior as space enclosed.” Few designs in Wright’s oeuvre so well illustrate the concept of designing “from within outward” as the Guggenheim Museum, in which the interior form gives shape to the exterior shell of the building. “Rather than a retrospective, this exhibition focuses on the diversity of Wright’s vision and the ways he sought to realize it, conveying fresh perspectives on how the buildings themselves celebrate that vision through spaces that enrich our lives with their transformational power,” said Phil Allsopp, President and CEO of the Frank Lloyd Wright Foundation, the only organization established by Frank Lloyd Wright to be the repository of his life’s work and the first to bear his name. “The concept of the exhibition also reflects a growing recognition of the enormous relevance today of Frank Lloyd Wright’s design philosophies, which embrace culture, technology and environment. The exhibition articulates the Frank Lloyd Wright Foundation’s public mission and active engagement in education, scholarship, design, research, historic preservation, and public policy.” The Frank Lloyd Wright Archives, which the Frank Lloyd Wright Foundation owns and operates at its headquarters in Scottsdale, Arizona, is the primary source of loans for the exhibition. During his 72-year career, Frank Lloyd Wright (1867-1959), who died just six months before the opening of the Guggenheim, worked independently from any single style and developed a new sense of architecture in which form and function are inseparable. Known for his inventiveness and the diversity of his work, Wright is celebrated for the awe-inspiring beauty and tranquility of his designs. Whether creating a private home, workplace, religious edifice, or cultural attraction, Wright sought to unite people, buildings, and nature in physical and spiritual harmony. To realize such a union in material form, Wright created environments of simplicity and repose through carefully composed plans and elevations based on consistent, geometric grammars. His innovative designs complement the surrounding environment of the site and intensify the physical, emotional, and social experience of flowing, continuous space within them. In his earliest designs, such as the Larkin Company Administration Building (Buffalo, New York, 1902-06) and Unity Temple (Oak Park, Illinois, 1905), Wright carefully deconstructs the box-like environment of his European contemporaries by opening up corners and using walls merely as screens to enclose tranquil interior spaces. Wright’s architecture is a translation of his conception of society into a spatial language that can be understood intuitively and enhances the everyday experience. While the aesthetic strength of Wright’s work has invited people to revisit his idiom, it is the ambition of Frank Lloyd Wright: From Within Outward to celebrate the basic idea behind his architecture—the sense of freedom in interior space—and inspire visitors to see the potential that architecture can carry for the here and now and for the future. Frank Lloyd Wright: From Within Outward is organized in a loosely chronological order and is installed to be viewed from the rotunda floor upwards. Off the first ramp in the High Gallery is an original curtain depicting Wright’s native Wisconsin landscape from the 1952 Hillside Theater at Taliesin, Wright’s home and studio in Spring Green, Wisconsin (1911-59). On loan from Taliesin, this curtain creates the backdrop for a sound installation of recorded oral histories from the collection of the Frank Lloyd Wright Foundation, which feature the voices of clients, friends, apprentices, and architects reflecting on the revelatory experience of living and working in Wright-designed spaces. Highlights of Frank Lloyd Wright: >From Within Outward include newly created three-dimensional scale models that examine the internal mechanics of functional space in relation to exterior form in a variety of Wright’s projects. Among these are an exploded version of the Herbert Jacobs House (Madison, Wisconsin, 1937); a mirrored model for Unity Temple; and a sectional model of Beth Sholom Synagogue (Elkins Park, Pennsylvania, 1953). Large-scale models of unrealized urban schemes for projects, including his Plan for Greater Baghdad (1957), the Crystal City for Washington, D.C. (1940), and the Pittsburgh Point Civic Center (1947), provide insight into Wright’s visions for the landscapes of the city. The models were developed by Michael Kennedy of New York-based Kennedy Fabrications Inc., which specializes in architectural models and prototyping, and Situ Studio, a Brooklyn-based firm focused on research, design, and fabrication. Special animations offer viewers the opportunity to experience an interpretation of nine of Wright’s un-built or demolished projects as well as his own Taliesin and Taliesin West. The animations were designed by teams of students from the Harvard University Graduate School of Design Interactive Spaces course taught by Allen Sayegh and from Madison Area Technical College, with the assistance of Archi Zarzycki of arc.studio.3d and ZD Studios (both also of Madison). The curatorial team for Frank Lloyd Wright: From Within Outward includes Thomas Krens, curator and Senior Advisor of International Affairs for the Solomon R. Guggenheim Foundation; David van der Leer, Assistant Curator of Architecture and Design; and Maria Nicanor, Curatorial Assistant, all for the Solomon R. Guggenheim Museum, in collaboration with Bruce Brooks Pfeiffer, Director of the Frank Lloyd Wright Archives; Margo Stipe, Curator and Registrar of Collections of the Frank Lloyd Wright Archives; and Oskar Muñoz, Assistant Director of the Frank Lloyd Wright Archives. Mina Marefat, an architect and Wright scholar, has served as Curatorial Consultant for the Baghdad module of the exhibition. Frank Lloyd Wright: From Within Outward has been designed by the Solomon R. Guggenheim Museum with Wendy Evans Joseph Architects of New York. In 1990, the Solomon R. Guggenheim Museum was declared a landmark by the New York City Landmark Preservation Commission and in 2005 was listed on the National Register of Historic Places. On October 7, 2008, the Interior Secretary of the United States named the Guggenheim a National Historic Landmark in recognition of the museum’s significance within American history and culture. UNESCO World Heritage Center also is considering Wright’s legacy: ten of the architect’s most relevant buildings, including the Guggenheim Museum, Taliesin, and Taliesin West, his home and studio in Scottsdale and the headquarters of the Frank Lloyd Wright Foundation, have recently been included on the United States’ World Heritage Tentative List, which identifies the most significant cultural and natural treasures worldwide. In anticipation of its 50th anniversary in 2009, the Solomon R. Guggenheim Museum recently undertook a four-year restoration, the results of which were unveiled in September 2008. At the outset of the restoration project, a team of architects, structural engineers, and conservators undertook a comprehensive condition assessment and found that, while the building remained in good structural condition, the removal of 11 coats of paint, the infilling of exterior cracks, the treatment of corroded steel structures, and the repair and reinforcement of the concrete were essential to insure the ongoing health of the structure. With its legacy grounded in the architecture of Frank Lloyd Wright, the Guggenheim is dedicated to exploring the connections between design, architecture, and other forms of art, especially in the context of the city. Design exhibitions organized by the Guggenheim have included the 2001 retrospective of the work of architect Frank Gehry, which became the most attended show in the history of the New York museum, and a retrospective of the work of architect Zaha Hadid in 2006. With such projects at the forefront, the Guggenheim has initiated the development of a broad program in which architecture and design become a means of expression to document, divert, and direct our increasingly urban societies. Following the presentation of Frank Lloyd Wright: From Within Outward at the Solomon R. Guggenheim Museum in New York, the exhibition will travel to the Guggenheim Museum Bilbao in Bilbao, Spain, where it will be on view from October 6, 2009 through February 2010. Frank Lloyd Wright: From Within Outward is accompanied by a fully illustrated exhibition catalogue published by Skira/Rizzoli. With forewords by Phil Allsopp, Richard Armstrong, and Thomas Krens, the catalogue will include essays by Wright scholars Richard Cleary, Neil Levine, Mina Marefat, Bruce Brooks Pfeiffer, Joseph M. Siry, and Margo Stipe. In addition to the exhibition catalogue, The Guggenheim: Frank Lloyd Wright and the Making of the Modern Museum will be published on the occasion of museum’s fiftieth anniversary and in association with the Frank Lloyd Wright Foundation. This first-ever book to explore the 16-year construction process behind one of the greatest modern buildings in America will examine the history, design, and construction of Wright’s masterwork. Fully illustrated with preliminary drawings, models, and photographs, the book includes three major essays by Hillary Ballon, Neil Levine and Joseph Siry. In conjunction with the exhibition, the Sackler Center for Arts Education at the Solomon R. Guggenheim Museum presents a full roster of educational programs, including Learning by Doing, an exhibition featuring a selection of shelters designed, built, and lived in by students at the Frank Lloyd Wright School of Architecture in Arizona and Wisconsin over the past seven decades. Curated by David van der Leer, Assistant Curator of Architecture and Design, in collaboration with the Frank Lloyd Wright School of Architecture, the exhibition provides an opportunity for visitors of all ages to create their own designs, which will be incorporated into Learning by Doing over the course of the summer. In addition, the Sackler Center will present the two-day symposium Frank Lloyd Wright: Now What Architecture?! on May 14 and 15 in the Peter B. Lewis Theater at the museum. Based upon the architect’s captivating 1931 question, this symposium—which will include debates on contemporary architecture and urban design among scholars, architects, designers, and cultural critics from around the world—will introduce Wright’s ideas about space into the 21st century’s dialogue. Among the additional public programming offered, The Architecture of Writing: Wright, Women and Narrative will be presented on Wednesday, June 10 at 6:30 pm. Moderated by Sarah Williams Goldhagen, The New Republic, participants will include Carol Gilligan, New York University, Gwendolyn Wright, Columbia University, and Beverly Willis, FAIA. Honoring Taliesin Fellow Lois Gottlieb, this special evening features the premiere of A Girl Is A Fellow Here: 100 Women Architects in the Studio of Frank Lloyd Wright, a new 15-minute film produced by the Beverly Willis Architecture Foundation, followed by a panel discussion that seeks to expand definitions of architectural genius in which collaboration, in general, and women, in particular, assume greater stature in the remarkable history of Frank Lloyd Wright and in the rich history of American architecture. This event is co-organized by the Solomon R. Guggenheim Museum and the Beverly Willis Architecture Foundation. For information, visit guggenheim.org/education or contact the Box Office at 212 423 3587. On April 13, one month before the opening of Frank Lloyd Wright: From Within Outward, the Graduate School of Architecture, Planning and Preservation (GSAPP) at Columbia University will host the panel discussion Frank Lloyd Wright in the 21st Century: Being Versus Seeming? Moderated by Kenneth Frampton, Ware Professor of Architecture at Columbia, with Michael Maltzan, Michael Maltzan Architecture, Los Angeles; Shohei Shigematsu, OMA*AMO PC, New York; and Marion Weiss, WEISS/MANFREDI-Architecture/Landscape/ Urbanism, New York, the panel will include an introduction of the Guggenheim Museum’s spring Frank Lloyd Wright programs by David van der Leer. For information contact Benjamin Prosky, Director of Special Events, GSAPP, Columbia University, 212 854 9248, or visit arch.columbia.edu. The Frank Lloyd Wright Foundation is a leading global multidisciplinary center for education, scholarship, debate, and research committed to the place of architecture and the arts in enriching the quality and dignity of life. The Frank Lloyd Wright Foundation’s mission is to educate and engage diverse audiences through programs that encourage innovative thinking about the relationships between architecture and design and the natural environment, and inspire a quest for beauty, balance and harmony in the creation of buildings and spaces that enrich daily life; and preserve the works, ideas and innovative spirit of Frank Lloyd Wright for the benefit of all generations. Wright established the foundation, headquartered in Scottsdale, Arizona, in 1940 to be the repository of his life’s work. The foundation owns and operates Taliesin in Spring Green, Wisconsin, and Taliesin West in Scottsdale, Arizona (Wright’s own homes and studios); the professionally accredited Frank Lloyd Wright School of Architecture; and the Frank Lloyd Wright Archives, widely regarded as the largest of its kind devoted to the works of a single artist worldwide. Both Taliesin and Taliesin West are National Historic Properties and are on the United States World Heritage Tentative List. For information visit franklloydwright.org.